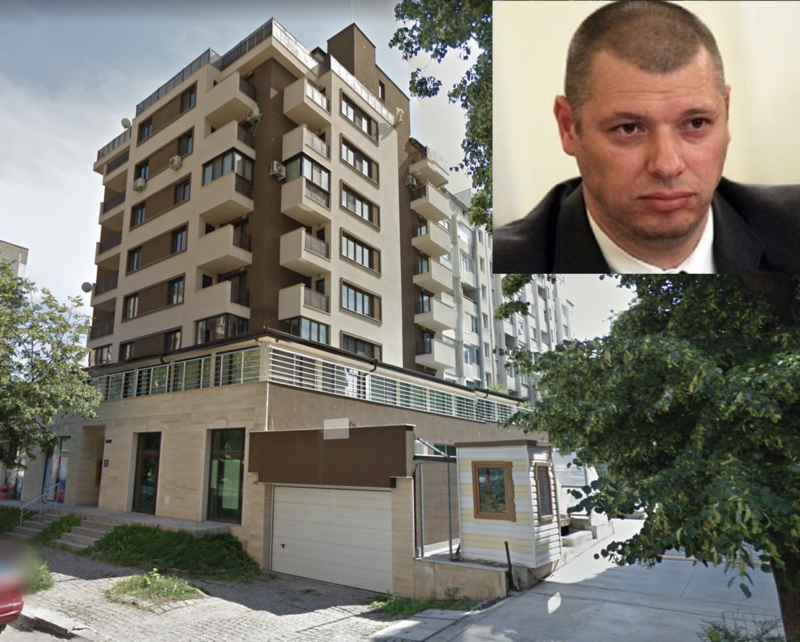 So far, the real estate tricks entangling senior Bulgarian officials in the #ApartmentGate scandal have involved private companies and individuals. It is clear that sales at below-market prices inflict damages on the budget indirectly through taxes and fees. However, when it comes to the deal with the terrace of Anton Slavchev, Deputy Chairman of the Committee for Combatting Corruption and the withdrawal of illegally acquired property (KPKONPI) (sic), the situation is even more dramatic as it is direct damage to the Sofia Municipality. Only BGN 39,486.88 from the sale of the terrace have entered its coffers. This is five times lower than the tax assessment of BGN 216,419 and at least eight times below the price that the Municipality could have received from a sale at market value. At the time of the purchase, the average price of a square meter in the “Hipodruma” (Hippodrome) district has been EUR 800. This is clear from the notary deed for sale on the glass-paneled terrace of 243.47 square meters. The company “JSC Nadezhda – 2004 P” sold to it Anton Slavchev, his life partner Zornitsa Todorova and his brother Svetoslav on December 28, 2011. By virtue of a contract with the Sofia Municipality and a special annex for the terrace, the Municipality has received in its bank accounts BGN 9,494.73 from Zornitsa Todorova, BGN 15,462.75 from Anton Slavchev and BGN 14,529.40 from Svetoslav Slavchev, or a total of 39,486.88. Against it, they have received ownership of the respective undivided shares of the terrace – 58.59 square meters for Zornitsa, 95.42 square meters for Anton and 89.66 square meters for Svetoslav. Therefore, their apartments, bought a year earlier on the same floor of the building, acquired exclusive access to the terrace, which had been built specifically for these apartments. There is no information on Zornitsa and Svetoslav Slavchev having sold their undivided shares to Anton Slavchev. It is also unknown why he has entered the amount of BGN 38,000 for one third of the terrace in his property declaration. Actually, Slavchev has paid only BGN 14,529.40. The ridiculous amount of BGN 39,486 barely covers the glass paneling of the huge terrace and cannot be entered in the title notary deed as its price, as it is well below the tax assessment of BGN 216,419. In addition, the latter is at least twice lower than the market price in 2011 for such a construction in this Sofia district. The entry had been done at the tax assessment price, but it is interesting that this entry took place a year after the signing of the notary deed – on December 28, 2012. At that time, the company “JSC Nadezhda – 2004 P” no longer existed. The Sofia City Court issued on March 19, 2012 a decision to remove it from the registries. In addition, the damage to the Sofia Municipality may be even greater, taking into account the history of the building and the deals of the company “JSC Nadezhda – 2004 P” with the Sofia Municipality. The land plot in “Hipodruma” of 2,210 square meters, on which the residential building on 4 “Nishava” Street has been built, is a municipal one. The lucrative plot costs at least EUR 3.5 million, according to the statistics on the site imot.bg for 2007. The Sofia Municipality, led by Borisov as its Mayor, could have sold it at an auction and make the most of it. Instead, the Municipality has issued a building permit for that plot to the same “JSC Nadezhda – 2004 P”. The entered fee for the due amount is BGN 919.92, which corresponds to BGN 919,920. The founders of “JSC Nadezhda – 2004 P” are not public entities and cannot have such money from business activity. It is important to note here that in 2007 the Mayor of the Sofia “Novi Iskar” district from Borisov’s party Citizens for European Development of Bulgaria (GERB) was the same Zornitsa Todorova, who later became the happy co-owner of a property in the newly built building and part of the terrace for a symbolic price. One year after acquiring the right to build, the condominium transferred it to the company “KGB Konstantin Vassilev”. The stated reason for the transfer is “repayment of debt”. In 2009, “KGB Konstantin Vassilev” transferred the right to build to “KB Engineering”. This is the company that has sold the apartments to Anton Slavchev and Zornitsa Todorova at prices that have nothing to do with the market ones. Somewhere here hides the explanation that an additional annex to the contract for building rights between “JSC Nadezhda – 2004 P” and the Sofia Municipality was needed for the terrace, which has been built later and is not part of the transferred rights to “KB Engineering”. The Municipality has generously agreed to give up its rights for such a ridiculous amount. Who are Zornitsa Todorova and Anton Slavchev? After the Mayor’s post in “Novi Iskar”, Zornitza Todorova has become the face of the party of “Bulgaria Forward” of Ivan Slavkov, the son-in-law of Bulgaria’s last and long-standing Communist Dictator, Todor Zhivkov. One of her remarkable public appearances was her visit in a very revealing evening gown to the National Assembly (Parliament) in 2015. Her life partner and Deputy Head of KPKONPI is a former employee of Bulgaria’s National Security Agency (DANS) and of the Interior Ministry. As such, the lens of photographers have also caught him in interesting situations. On one of the pictures, he is seen together with Bulgarian drug lord Konstantin “Samokovetsa” Dimitrov, who was killed execution style in Amsterdam in 2003. Asked about the context of this photo, the KPKONPI’s press office replied that the photo had been taken at the time of Dimitrov’s arrest. As soon as Bivol received this response, we sent to Anton Slavchev, through the KPONPI’s press office, questions on the terrace and the prices of his apartments, but no response was received. However, the casual look and relaxed attitude of the people in the picture and the lack of handcuffs, uniforms and other attributes of a classical arrest operation are raising questions. Anton Slavchev is expected to appear before the media on Monday, April 8, as Bulgarian President Rumen Radev invited him to report to the National Security Advisory Council instead of his boss Plamen Georgiev as the Head of State says that he has lost his trust in him after the scandal with Georgiev’s terrace.